NEW SPEED CAMERAS are today being installed in Dublin’s Port Tunnel which will measure a driver’s average speed over a distance – the first time such a system has been used in Ireland. As motorists enter the tunnel, their cars will be photographed. A second photo will then be taken as they exit the tunnel and the time a driver takes to make it between the two points used to determine if they have committed a speeding violation. This system – different from fixed speed cameras, which measure speed at one individual point – are shown to bring about a 50% reduction in the collision rate once in use, Transport Infrastructure Ireland has said. The new system is coming at a time when major boosts in traffic have upped the chances of a crash happening in the tunnel. Open since 2006, the Port Tunnel has seen a 40% boost in traffic levels in the past five years. When drivers are caught speeding, their information will automatically be sent to An Garda Síochána to allow them to take further action. “We welcome this enhancement to the operations of the Dublin Port Tunnel,” said Chief Superintendent Aidan Reid from the Garda National Traffic Bureau. Due to an increase in traffic travelling through Dublin Port Tunnel this new enforcement system provides additional support toward maintaining a safe travel experience for all users of the Tunnel. Similar systems that issue penalties and fines depending on a driver’s average speed are in place in parts of Europe including in the Netherlands, Poland, Austria and Italy. A similar system in the United Kingdom of SPECS (Speed Check Services) cameras is currently in operation, and is generally found on motorways or dual carriageways. The distances over which an average is taken vary in distance from less than a mile up to almost 100 miles. 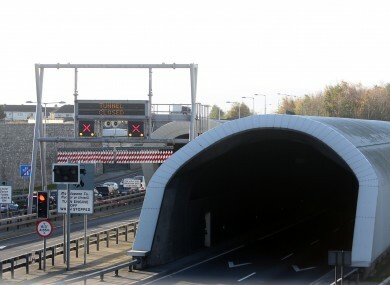 Drivers passing through the tunnel will have a picture of their car snapped in both lanes – meaning that switching between them will have no effect on how the system operates. The system is set to go live later this year. Email “Groundbreaking new 'speed over distance' speed cameras for Port Tunnel”. Feedback on “Groundbreaking new 'speed over distance' speed cameras for Port Tunnel”.